� It came stock with 584 KB Base Memory, and 2MB of Extended RAM Memory (in newly developed SIMMS). � It featured a newly developed Cirrus Logic CL-GD video subsystem, adapted by many proprietary manufacturers of the late 1980's early 1990's. 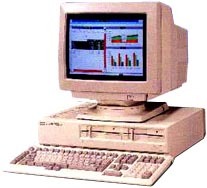 � It featured an i386-DX processor, as well as an optional mathematics coprocessor. � It ran at about 16Mhz and ran MS-DOS and any variations of PC Compatible software, as well as Miscrosoft Windows. � It used the AT style Keyboard, 2 5" Floppy's, or one 3.25 Floppy and one 5" floppy, VGA/VESA technology and ISA bus. � It also featured a Thomas Conrad ethernet adapter. Preceding i286 processor models was called FM-R60 (high-resolution model) and FM-R50 (standard 640x400 dot resolution model). R60 and R50 had a sub-model with HDD (FM-R60HD /FM-R50HD) and without HDD(FM-R60FD/FM-R50HD). Mainly, these machines were used as a terminal of Fujitsu M-series(M-3xx/7xx) mainframe, with a F6650 connection card (interface card) and a F6680 emulator software. PERIPHERALS Thomas Conrad ethernet adapter. see more Fujitsu FM R 70 Ebay auctions !